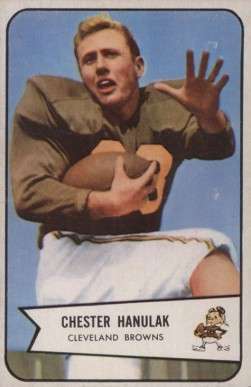 Chet Hanulak (born March 28, 1933 in Hackensack, New Jersey) is a former professional American football player who played running back for four seasons for the Cleveland Browns. Hanulak played football at Hackensack High School and was recruited to play on the Maryland Terrapins football team after his high school coach met the Maryland coach while both were attending a summer course. 1 2 "Chet Hanulak, HB at NFL.com". NFL.com. November 2013, webpage: Chet Hanulak. ↑ Powell, K. Adam. Border Wars: The First Fifty Years of Atlantic Coast Conference Football, p. 3. Scarecrow Press, 2004. ISBN 9780810848399. Accessed July 12, 2016. "Hanulak's story was an interesting one, for he was not highly pursued during his days at Hackensack High School in New Jersey."